“But life is not changed magically by a poetic act” is a video installation that builds a narrative about autogestion (or self-management) in a community in Caracas, Venezuela. 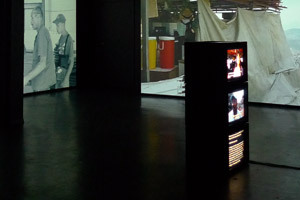 Using wall projections and an installation of monitors, “But life is not changed magically by a poetic act” sets documentary interviews, architectural and urban establishing shots, and textual elements in dialogue. Using long takes of an expropriated Coca Cola bottling plant, a small community-run brick making factory, and vernacular architecture in the barrio Gramoven, and setting these in dialogue with interviews of members of community councils in Caracas who are actively altering forms of community organizing and urban governmentality, Urban Subjects have created an installation that pursues an argument spatially, didactically, and poetically. Taking its title from a sentence written by Henri Lefebvre in the revolutionary heat of May 1968, this installation also tries to grasp a sense of the deeply affective alliances that autogestion builds in the texture of everyday urban life: how can a hybrid form of documentary and aesthetic video installation represent the textures and possibilities of urban life? Cutting across the naturalized form of documentaries “But life is not changed magically by a poetic act” opens the manner in which the community activists in Caracas take apart North American media frames of Venezuela and its social programs. What emerges is a complex moment of performance, global-local media analysis, critical reframing, and importantly, a view of housing and community that is based on a form of dual power.